Brass vent covers can be hard to find but these durable vents have a beautiful and lustrous plated finish. This return air grate is a flat grille which is left open to direct airflow in your home. 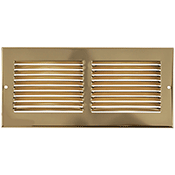 These brass vent covers are constructed from all steel and have a 3/16 inch turnback margin. Our return air grates have fins spaced at 1/3" from each other and are set at 20 degree angle. These brass vent covers can be used either on your ceiling or against your wall. Screws for the return air grates are included with the purchase, making installation simple. Screw mount the brass vent covers over the duct opening and you are done! 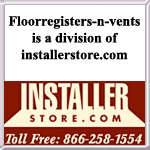 Return air grates should be ordered by the corresponding measurements taken from your duct opening. Tip: The return air grate is listed by the hole size opening. For the faceplate dimensions, add about 1 1/4" to what is listed below. For example a 14" x 14" will measure 15 1/4 x 15 1/4 overall. These brass vent covers are listed by the duct opening measurement in your wall and should be ordered as such. A 14" x 14" duct opening requires a 14" x 14" return air grille. 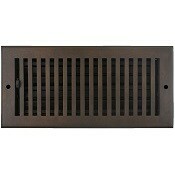 For other great return air grates check out our variety of finishes offered. Interested in something with more depth? Well we also have this brass vent with a 7/8" turnback. Order your brass vent covers with us today for a quality product which will spice up your style. Size 10" x 6" 14" x 6" 30" x 6" 10" x 8" 12" x 8" 14" x 8" 24" x 8" 30" x 8"